Helen Richardson-Walsh could make her first Great Britain appearance in over a year after being named in the squad to face Japan in London on Sunday. The 33-year-old has been sidelined with back trouble and only returned to full-time training at the start of the year. Leicester goalkeeper Sabbie Heesh is also included and hopes to win her second senior international cap. The squad of 20 - which will be reduced to 18 on Sunday morning - features seven players from the London Olympics. 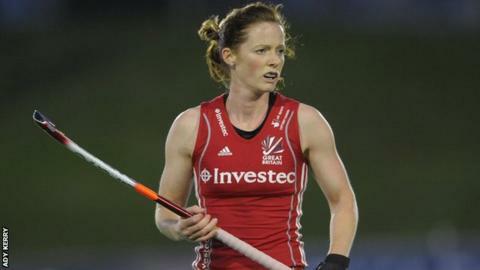 GB have won six and lost two against Japan, beating them 4-0 at London 2012 en route to winning the bronze medal. "Japan will set us a number of different tactical challenges with an Asian style of play which will feel different to our playing group, said head coach Danny Kerry. "This type of experience is great for the development of the team." Great Britain squad: Maddie Hinch (Holcombe), Sabbie Heesh (Leicester), Emily Maguire (Reading), Kate Richardson-Walsh (Reading), Hollie Webb (Surbiton), Giselle Ansley (Surbiton), Zoe Shipperley (Buckingham), Laura Unsworth (Holcombe), Helen Richardson-Walsh (Reading), Georgie Twigg (Surbiton), Shona McCallin (Slough), Susie Gilbert (Reading), Susannah Townsend (Canterbury), Lily Owsley (University of Birmingham), Joie Leigh (Clifton), Alex Danson (Reading) Sophie Bray (East Grinstead), Hannah Macleod (St Albans), Sarah Robertson (Holcombe) Ellie Watton (St Albans).